[PODCAST TRANSCRIPT] Episode 1: Introduction to the Podcast | What is an FM Innovator? Be an FM innovator!® But wait! What does that even mean? What is an FM innovator? We’ll answer that question and so much more. Hey there and how's it going? I am Mike Petrusky and I am so glad you are here. I will be your host, your lead interviewer, the Director of FM Innovation. I mean, hey! I guess I can give myself whatever title I want right? So maybe we can really tap into my lifelong dream of being on the radio. So, yes you can just call me "DJ Mike P." Yo, Yo... good times! But welcome, welcome again. I am so thankful that you took a few minutes out of your busy day to listen to this, our very first episode of the facility management innovator podcast. I mean, wow! This is cool stuff. We've been planning the launch of this podcast for awhile and I’m really excited to share with you a few of the interviews we've recorded so far and those we have planned in the coming weeks. We've got some great guests lined up and we will talk to them about their experiences in the facility management community so we hope to share a lot of useful content for you, whether you are a sales and marketing professional bringing your unique offering to the marketplace or maybe you're a facility management practitioner looking for reliable solutions to meet the challenges you face each and every day. We'll talk about it all. We’ll hopefully talk about workplace resources, trends, marketing strategies, technologies and innovations and really the collaboration that's taking place in our FM community. Lots of really great information coming your way now for this introductory episode. I do not have a guest with me so I thought it would be helpful to take just a few minutes and explain a little bit about what we hope to do in the coming weeks with this new channel and personally I am really excited about this podcast platform because it's something super cool to me. Like I said before, it's like a radio show almost and of all the things we've done at Kayrell Connection so far, I think this is one of the most exciting. I do love writing. I enjoy the blogs and posting them on LinkedIn and want to say thank you to those who have actually read those articles and commented and shared them with others. Thank you so much. I do appreciate it and of course we love doing the video interviews. Those are a lot of fun and we'll continue definitely filming those and please by all means if you have not seen them check them out at the Kayrell Connections website or YouTube channel. But podcasting - this is a unique format where we get to go a little bit deeper and talk about some interesting content and really get to know each other a little bit better. I know everybody's time is limited and really let's be honest we have shorter attention spans and ever these days and distractions are hitting us each day. I know I struggle with it. I mean wait, What? Squirrel!... No seriously, right? Anything longer than about three minutes and unless it's super compelling, I'm tuning out, aren't you? So I guess this is the moment of truth, are you still listening? It's been about three minutes and I hope you're still out there. But all that said these podcasts are great and there seems to be a podcast out there for just about every subject under the sun, but, well almost everything. I did some searching and I really didn't find anything that was specifically related to the facility management community and certainly nothing with a focus on innovation and technology and building partnerships in the workplace. So here we are and here I am hosting a “radio show” for you and I'm really excited about it. Let's talk about the reason you checked in to listen to this podcast today. We need to get an answer to that question we started with at the beginning of the show, what is a facility management innovator? 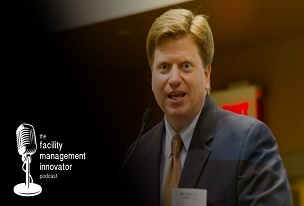 Well I believe in FM innovator is someone who is passionate about facility management, they've invested the time to understand the challenges that FM's face, they worked hard to become a subject matter expert in their field, and they're willing to challenge the status quo and take a few risks in order to make a positive impact on the workplace by delivering innovation and solutions, and by doing so, they enhance the FM community and really prove their value to facility managers. So I'm first talking about the best salespeople and marketers out there. The ones that are willing to share their industry knowledge and be educators, collaborators, the true partners to facility management professionals that are necessary to get things done in the workplace and that's what Kayrell Connections is all about. We were founded for that reason - to help these folks better communicate their expertise and deliver their company's innovative solution to the FM community and that's what we try to do each day for our clients. And I hope you doing a good job with that. What about the FM practitioners, you ask? I mean most FMs, by default, or by necessity, really I would say, are considered FM innovators as well. Each and every day they have to adapt and innovate to run the facilities effectively. So I meet many, many facility professionals and I see that they recognize the true value of collaboration with both their fellow FMs and also with the industry partners that are available to them. So they leverage their entire network to meet the challenges of the workplace head-on and these folks, and I've met many of them...I've had that privilege over the last several years... are certainly FM innovators. So that's it. That is what this podcast will be about. We will be talking about how industry partners are using their expertise and creativity to deliver resources and innovative solutions that help to advance the FM profession and we'll also chat with some of our FM practitioner friends to learn how their relationships and their connections through IFMA and other organizations are helping to advance their careers and we'll just talk about the trends they're seeing and where they think things are going in and how there is real collaboration going on with industry partners that will help lead us to a sustainable future and how we'll do our best to continue to elevate the facility management profession. So I hope you'll be a part of the conversation with us. Please subscribe to this podcast at iTunes and leave us your comments there you can also send your suggestions via email to me at connections@kayrell.com, and of course, you can connect with me on LinkedIn or Twitter. That's @MikePetrusky or just give me a call at the office, the good old-fashioned phone call. Ah, remember the phone? That's a classic! I look forward to hearing your feedback. Don't be shy. Tell me what you really think. We want to make this podcast something valuable for you and for everyone in the facility management community so I’d love to hear your ideas for topics, people to interview, anything. Ok, sound good? Good! I'm glad we're all in agreement about that. So until next time I want to encourage you to continue to "Be an FM innovator! "® Peace out!